Healing Choices for Prostate Cancer Treatment is the brainchild of psychologist and researcher Michael Diefenbach, PhD, of the Mount Sinai School of Medicine in New York. His interests are aligned with mine and with many of you who have been diagnosed with prostate cancer. I’ve enjoyed corresponding with him and speaking with him on the phone and commend him to you. Though your doctor probably mentioned treatment options when you received your diagnosis, the information can be difficult to understand at this emotional time. Once you've had time to get over the initial shock of a diagnosis, you'll have questions about your treatment and want some answers. That's what the Healing Choices Study is all about. Healing Choices for Prostate Cancer is a study dedicated to finding out the best way to help men like you get important information about prostate cancer; information that will help you make the treatment decision that's right for you. If you have not yet decided on a treatment, I urge you to call this truly concerned researcher and take part in the study. It is non-partial and unbiased. No surgical practice or pharmaceutical company has anything to gain. In fact it is funded by the National Cancer Institute. The only purpose of this study is to help you make decisions that are right for you and that reflect your values. To find out how useful the study was to you, he will arrange to call you twice during the next nine months to ask you a few questions. • Have not yet started your prostate cancer treatment (e.g., surgery, radiation therapy, active surveillance or watchful waiting). • you will be mailed a variety of important and helpful information on prostate cancer options -- ranging from printed materials to multimedia CD-ROMs. The three phone calls will take an average of 20 minutes, total. All information is totally confidential and will not be shared outside the study team. Following the survey you will receive a very helpful list of phone numbers and websites, which along with this site can help you find answers to your questions about prostate cancer. 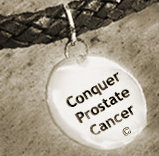 Thanks for ...helping people in prostate cancer treatment. There is a lot of confusion to choose treatment options for prostate cancer.